This week I look at a few newspaper articles pertaining to St. Louis election fraud in 1920 - and a case that went to the State Supreme Court. In 1920, the ballot boxes, tally sheets, and poll books were subpoenaed during an election inquiry. An election judge, named H.S. Feinstein, objected - arguing that the subpoenas violated the secrecy of the ballot. Judge Hartmann in the Circuit Court today overruled the petition of Attorney Patrick H. Cullen, which asked that the court set aside its order for the opening of the primary ballot box in the Twenty-fifth Ward Sixteenth Precinct. The decision leaves the way open for a continuation of the grand jury investigation into primary irregularities. The inquiry had been temporarily halted after Cullen filed his petition yesterday in behalf of H.S. 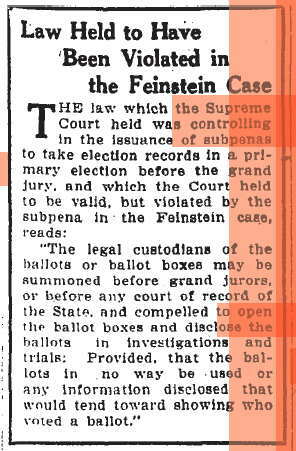 Feinstein, a judge of election. The ground alleged for setting aside the order was that opening of the boxes would violate the secrecy of the ballot. Judge Hartmann announced that he based his decision on a State Supreme Court decision handed down in 1913 in which the court refused to issue a writ of prohibition to prevent Judge Kinsey from ordering ballot boxes opened. After Judge Hartmann’s decision was handed down Attorney Cullen announced that he would apply to the State Supreme Court for writ of prohibition in the cases of Feinstein and all other precinct officials who have been summoned to produce the ballot boxes and books of the Sixteenth Precinct, Twenty-fifth Ward. There was an agreement that pending the disposition of Cullen’s application for a prohibition writ investigation as to the precinct in question would be halted, but the general inquiry into election matters not covered by this petition would proceed. The Missouri Supreme Court held that the law had been violated by the subpoenas. Declares Supreme Court’s Objections Could Be Met If Poll Books Were Not Taken Before Grand Jury. Circuit Judge Hartmann, after reading the text of the opinion of the Missouri Supreme Court handed down yesterday prohibiting the opening of ballot boxes in a grand jury inquiry into primary election frauds under subpenas duces tecum issued by him, today said that in his opinion it would be possible for a subpoena to be issued which would meet the objections found by the court. The subpenas under which the Election Commissioners were required to produce the ballots before the grand jury, also required the production of tally sheets, poll books and official returns and statements made by the judges and clerks of election. The Supreme Court held the subpenas void because they placed before the grand jury an opportunity to learn how each individual voter voted, and thus destroyed the secrecy of the ballot. 1) I have retrieved the text of the Supreme Court decision, but it provides no further details as to the identity of H.S. Feinstein. Initials definitely make identification more difficult. However, since the articles do provide ward and precinct, I am helped by the case occurring in a census year. My great grandfather's brother, Harry S Feinstein, was recorded in the 1920 census as residing in the 25th Ward, 16th Precinct. His was the only Feinstein household in St. Louis recorded there. If there was another H.S. Feinstein, they weren't in the 1920 census. 2) Other newspaper articles indicate he was a Republican election judge.